This pie starts with my go-to dairy-free pudding made with cornstarch, coconut sugar, coconut milk, and vanilla. The option is to add shredded coconut to the filling (which I did). But for a creamier center, omit and reserve the coconut flakes for topping! Next, it’s folded with plenty of coconut whipped cream and ready for the crust. For the crust I went with my almond-oat crust that’s becoming my absolute favorite when it comes to pies and snack bars. It’s so versatile and reminds me so much of graham crackers without all the extra ingredients or sugar. More creations to come with this beauty – stay tuned. This would make the perfect pie to have on hand for entertaining guests or to take along to gatherings and BBQs. 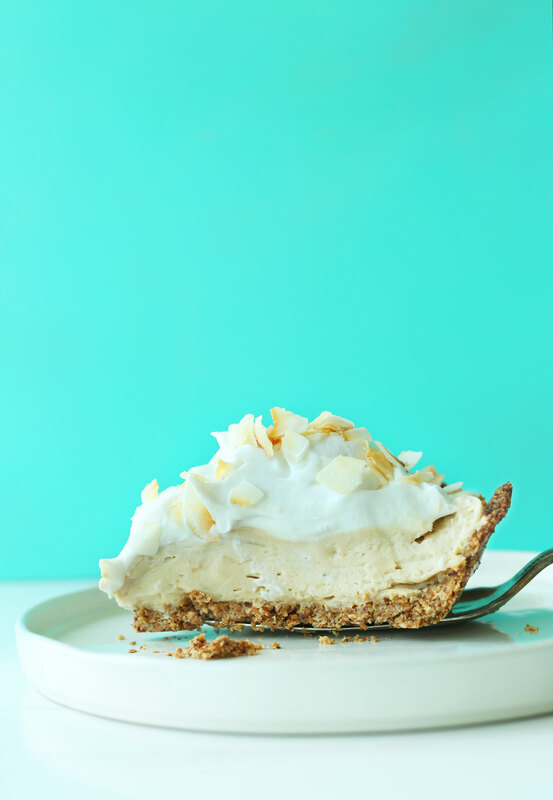 Who doesn’t like coconut cream pie (seriously)? Plus, this version is vegan and gluten-free so everyone can enjoy. If you make this recipe, let us know what you think! And if you dig this, you’ll definitely like our Banana Cream Pie (where are all my cream pie lovers at!?). Leave a comment it and rate it once you try the recipe, and don’t forget to tag a picture #minimalistbaker on Instagram so we can see! Cheers, friends! 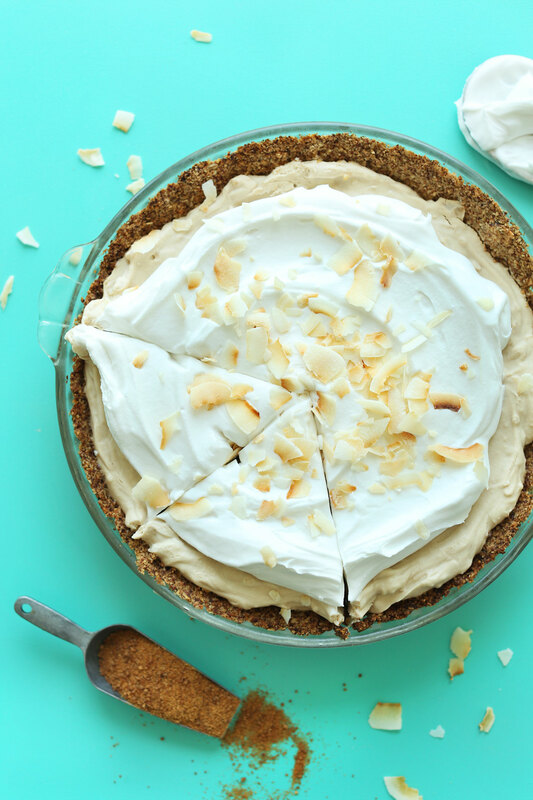 10-ingredient vegan coconut cream pie with naturally-sweetened oat-almond crust, coconut pudding filling, topped with fluffy coconut whipped cream! Preheat oven to 350 degrees F (176 C) and either line an 8x8-inch baking dish with parchment paper, or grease a standard pie dish (adjust number/size of pan if altering batch size). Set aside. Add oats, almonds, sea salt (optional), and coconut sugar to a high-speed blender and mix/pulse on high until a fine meal is achieved. Remove lid and add melted coconut oil, starting with 5 Tbsp (amount as original recipe is written // adjust if altering batch size) and adding more if it's too dry. Pulse/mix on low until a loose dough is formed, scraping down sides as needed. You should be able to squeeze the mixture between two fingers and form a dough instead of it crumbling. If too dry, add a bit more melted coconut oil. Transfer mixture to prepared pie pan or baking dish and spread evenly to distribute. Then place parchment paper on top and use a flat-bottomed object, such as a drinking glass, to press down firmly until it’s evenly distributed and well packed on the bottom and up the sides. If using a pie pan, use your fingers to press it evenly as possible up the sides of the dish. Bake for 17-22 minutes or until the edges are golden brown and there is some browning on the surface. Remove from oven and set aside to cool. 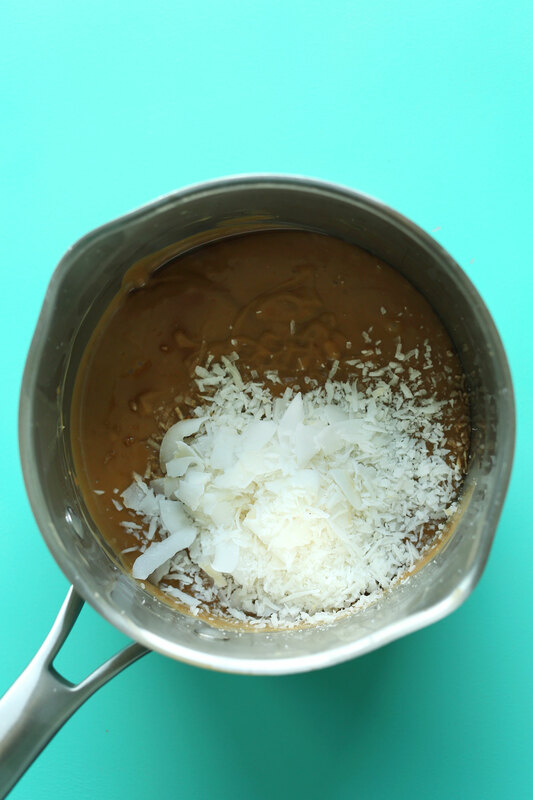 In the meantime, prepare pudding by adding cornstarch, coconut sugar, and salt (optional) to a small saucepan and whisk in coconut milk to avoid clumps. Once it appears "jiggly" and a visible ribbon forms when you drizzle some over the top with your spatula, remove from heat. Whisk in vanilla and coconut flakes (optional - will add a 'crunchier' texture) and transfer to a glass or ceramic bowl and cover with plastic wrap, making sure the plastic wrap is touching the surface or it will form a film. Refrigerate until cooled and set - about 2-3 hours. In the meantime, place a medium-large glass mixing bowl in the freezer for your coconut whipped cream. Remove coconut cream cans from fridge, being careful not to shake or turn them and remove top. Gently scoop out the top hardened "cream" into the chilled bowl, leaving any liquid watery portion behind. You can use this for smoothies or in baking, if you wish. Otherwise discard it. Use a handheld mixer to whip the coconut cream until it begins to look like whipped cream - about 1 minute. Then add desired amount of organic powdered sugar. Beat again until light and airy - about 2-3 minutes - scraping down sides as needed. Set in refrigerator (covered) to chill. Once the pudding is completely cooled, is jiggly and set, add half of the coconut whipped cream and stir lightly until just combined. Set in refrigerator. Add custard-coconut whip mixture to the baked crust and smooth the top with a spoon, then cover with plastic wrap and set in the refrigerator for at least 4 hours, preferably overnight, to chill/set. To serve, top with remaining coconut whipped cream and toasted coconut flake, slice, and enjoy! Store leftovers gently covered in the refrigerator up to 3 days, though best within the first 48 hours. *I tried using arrowroot starch in this recipe in place of cornstarch and it was very gummy as a result. I recommend using cornstarch. 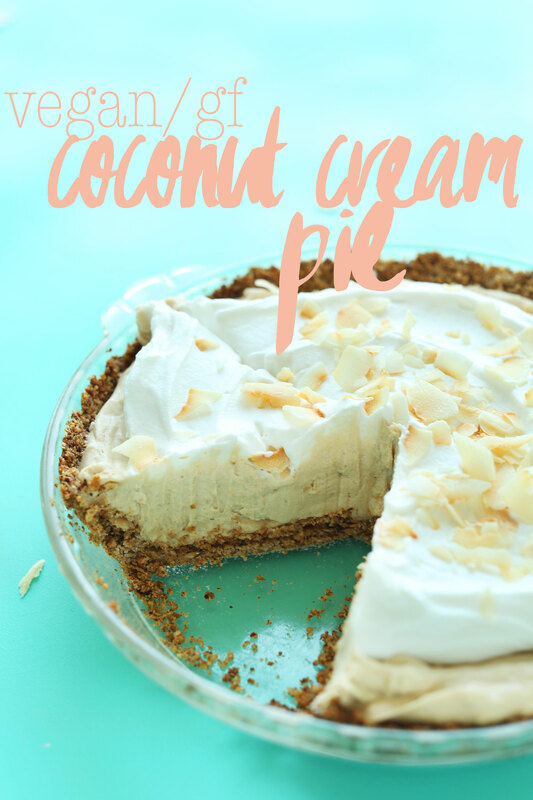 *Nutrition information is a rough estimate calculated with all of the prepared coconut whipped cream and 1/2 cup total shredded coconut per 10 slices. *Recipe adapted from my Vegan GF Banana Cream Pie. 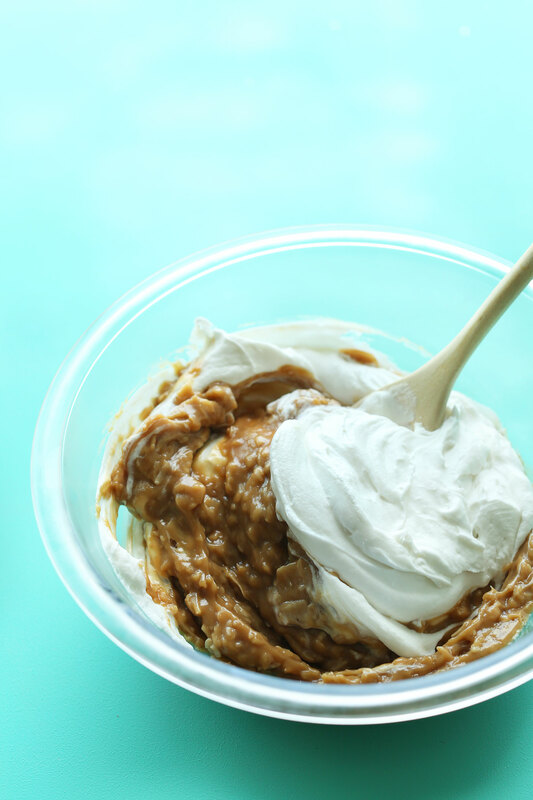 *See all my coconut whipped cream tips here! I’ve just tried this recipe and couldn’t even get started because the pie crust itself is a disaster. There should be an update to this recipe that states at the top that you should slowly drizzle in the oil until the desired consistency is achieved. I wish I had read the comments before starting. Hi David, sorry to hear this didn’t work out for you! We just retested the recipe and it seems that it turns out more oily with pecans, but is a good texture with almonds. Did you use pecans? Another reason it could end up too oily is if in measuring the oil, the tablespoons were not leveled. We have now made modifications to the recipe. Hope that helps! hi. i know you recommend NOT to use carton of coconut milk but can you tell me WHY it has to be canned? Hi Sue! If you were to compare both, you’d notice that canned coconut milk is much thicker and includes a thick layer of coconut cream. This recipe requires that consistency, which isn’t found in a carton of coconut milk. Hope this helps! I love your recipes!! This one is definitely a go too for sure! It’s my husbands frequent request now when it’s our job to bring desert. Thank you! My boyfriends family wants me to make this every thanksgiving! This will be my third time baking them! I personally love the apple deep dish crumble pie I make from here too (so delish if you haven’t checked it out)… but they LOVE this pie and BEG me to make it every thanksgiving. Hi, would using cocowhip from the store instead of the homemade coconut whipped cream work to add to the filling? I didn’t leave my coconut in the fridge overnight! Can I add some ice cubes? Please help ? Throw it in the freezer for an hour! My 10 year old son has been politely asking me, every day this week, if/when he can make a pie in order to fulfill a club requirement for baking. I knew that he needed a real recipe to follow, not just a fruit pie out of my head. Anyway, found your recipe here, which looked easy, yet challenging enough for him. He was super excited as the cornstarch firmed up in the pan. We were out of all things nuts, so I used almond flour as a substitute for the crust. We have a maraschino cherry tree on our property. My son picked a bowl full & used them to decorate the whip on top. The addition tasted like an amazing vegan alternative to cheesecake. We had 7 people dining this evening and this pie was so delicious that adults down to a 3 year old were completely stuck into their servings, offering “thank-you’s” between bites to my son. He was thrilled to have made something so tasty and beautiful as well. I had to offer thanks to you here, for sharing this recipe! Yay! We are so glad that everyone enjoyed this recipe, Mable! I’m not sure what happened, but this pie turned out terribly. The filling was brown (I’m guessing from the coconut sugar), very dense, and kind of odd due to the texture of the coconut flakes. Oddly, the coconut flavor was not very pronounced. I must have gotten a weird batch of coconut milk/cream. The crust was also way too hard – it would probably be better to substitute Earth Balance for the coconut oil. I’ll try making this pie again and will report back if there are any improvements. Hi Stephanie! thanks for the feedback. The color is definitely due to the coconut sugar, so next time you can sub cane sugar instead. The crust being to hard may be due to a slight over baking? Next time scale back a little (or try earth balance as you suggested). Let us know if you try again! I made this and it taste amazing. But when I added the coconut cream to the coconut pudding it got a little lumpy what did I do wrong? I am still confused as to what type can coconut milk to use? Is it the same type as the full fat but just the light and you shake it it and use all of it? Hi Mary! We use this one. My husband made this delicious pie. I have a milk allergy and this was a real treat. Thank you for the recipe. Hi Shelyn! We recommend just using coconut sugar, so regular brown coconut sugar will work! Ok …I made it with the brown coconut sugar and my custard was brown not yellow like your picture … I’m not sure what went wrong as I followed the recipe the way you gave it ??? Yes, using brown coconut sugar would change the color a bit. I was so excited about this recipe. We decided to make it as one of our Christmas desserts. I have to say this was awful. I can’t even begin to describe the bad flavor. We had to throw it out. I love vegan coconut cream pie too. It took so much time to make…. Really frustrating and a total disappointment. Luckily we had another vegan backup dessert. Wow! This is amazing! I’m always on the lookout for vegan deserts and this was perfection. Just made this for my husband and he had no idea it was vegan. Just delicious all the way around! Didn’t change a thing. Thank you!!! Just made it! :) I tried the filling and the whipped coconut cream, but have yet to taste the full effect! The only thing is that I feel like it was maybe too much cornstarch…after my jelly was set and I was mixing in half of the cream, it wasn’t mixing very well, the filling was a little too jellified. I think next time I would half the cornstarch or just add 1 TBSP. Tried to make it, subbed pecans for almonds in the crust and the coconut oil made the crust so runny I could add enough oats to fix it. Tried to bake with it being liquid like and it never cooked…had to scrap and restart. Super expensive ingredients to have to start over ☹️. 1. The raw crust was very, very wet. I used a 50/50 pecan/almond mixture and added 5 tbs of coconut oil. It was so runny that when I pressed it into the pie pan, it would not stay. It slid back down and made a pitiful looking pie crust after baking. The edges were starting to burn before the bottom, middle was crisp. 2. The filling took quite a bit longer to “set” than the recipe calls for. 3. For the whipped cream: I have never made coconut whipped cream. When I placed the cans in the fridge to chill, I hurriedly shoved them in there, with one upside down. Little did I know that they are already somewhat hardened from sitting on the shelf in the store, so I should have made sure to put both of them in the fridge right side up. When I opened the first can (upside down), I was a little confused as to why it wasn’t very hard. . . to make a long story short, my first can of the “cream” was a little runny. So my coconut whipped cream never set as I would expect it to. Even after chilling for a few hours, it is still quite runny. I went ahead and mixed half of it with the filling, and spooned it into the crust. The filling seems quite runny. It definitely would not hold together if a slice was cut now. I placed in the fridge. 4. In order to get the right consistency, I am considering freezing it and then thawing for a little bit before serving at lunch time tomorrow. I’m making this for my MIL this Thanksgiving-should the coconut milk be unsweetened? Thanks! Hi Mandy! It doesn’t need to be! Just wondering how do you manage to make whipped coconut cream? I never ever achieved it. Always ended up having disgusting layer of water and gooey layer of coconut something. I decided to make an experiment and I bought 7 different makers of coconut cream in cans and all came out the same bad. What milk/cream do you buy (how much % of coconut is in there) ? Thank you if you reply, I am really struggling with tat one. Hi Cindy! It doesn’t, when they thaw out, they tend to be watery. It is best to refrigerate it! Made this for the first time. It was delicious! I substituted cane sugar for the coconut sugar. Reduced the sugar in the crust by half and reduced the sugar in the filling by a third. I substituted earth balance for the coconut oil in the crust. I included the optional coconut in the filling (unsweetened, toasted). I only had full fat coconut milk on-hand so used that for the filling as opposed to the lite. A double recipe was enough to fill one pie. I used store bought coco whip for the whipped topping. Everyone who tasted it commented on how good it was. My topping dodnt work, I used 7tbsp of icing sugar but it was runny. Also burnt the crust but saved half of them, obly but in 10 mins (but I made 12 small vs one big one). I skimmed cream off can but only left 4 hrs in fridge. After putting in fridge 2hrs, whipped topping looked nothing like picture, but I didnt mind as the yellow middle was delish! The crust was to die. The flavours blended superbly, and I enjoyed the rest if the puddings in cups as I burnt crust as I put in cupcake cups so as I wouldn’t eat it all in one go lol. hi! is the powdered sugar necessary in the whipped cream? possible to use anything else or is it needed to stabilize? Why can’t we use carton of coconut milk instead of the canned kind in the filling? Hi Sue! No, I wouldn’t recommend it! 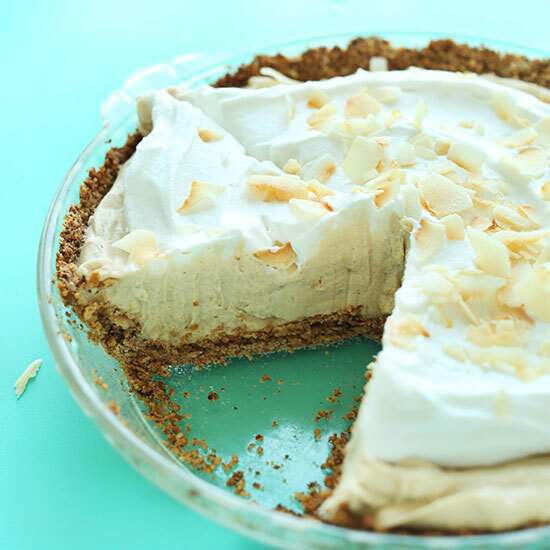 I made this pie and it is the best coconut creme pie I have ever had. It is so delicious, so creamy and yummy and sweet, without being too sweet. I’ll make again and again. Thank you. Would using coconut flour work instead of cornstarch? I am fairly new to your site and I have been adoring your recipes!! They are so delicious! I recently made this recipe also, and it was so good! Have you considered making this recipe with a lemon filling? Kind of like a lemon meringue? I bet it would be amazing! Just made this for my husband’s Valentine’s day dessert (a bit early!) It was easy to make, looks beautiful and taste grand! I’m always looking for vegan sweets! Looks amazing…can’t wait to try it. Just made the pie and here’s a few pointers for others. I didn’t use the coconut oil in the piecrust because I’ve found it makes an oily crust and when refrigerated it gets hard as rock so when you cut a slice of pie it splinters the crust. Instead I used Earth Balance vegan buttery sticks with great results. more protein to set up. Last I missed the step to combine 1/2 the coconut cream into the pie base. So just poured the base into crust (I lined my entire pie plate w/parchment paper) let cool in fridge then topped with the whip cream and toasted coconut. Came out delicious!!! OMG good. Light texture had to have second slice. Next time I’m going to also add 1 tsp. of coconut extract as standard recipes call for in addition to the vanilla extract. Hope this helps. Yeah, I know this isn’t vegan with my changes. I made the pie and I think it got better after three days in the refrigerator. It seems the taste has become more concentrated. Is there any sort of thickener other than cornstarch you rec commend? I can’t eat corn products but this looks wonderful. I saw arrowroot starch isn’t recommended but what about tapioca or potato starch? Hi! I haven’t tested this recipe with tapioca or potato starch but if you do, let me know how it goes! I think arrowroot is another name for tapioca. Could I use full fat coconut milk instead of lite? It’s just what I have on hand, didn’t know if it would cause problems. Thanks! I made this for a work holiday party and everyone LOVED it, it made me feel very proud :D Thanks for the wonderful recipe with detailed instructions as always. Next time I make this, I might try a different nut instead of almonds in the crust. I am absolutely loving the coconut whipped cream and will be making the banana cream pie with it soon! Hi, I followed this recipe to a tee and found that the pie filling didn’t really “set” and is actually still quite soft even after being in the fridge for 12 hours. Is there anything I could have done differently? Hmm, perhaps next time make sure your pudding is thick enough (add a little more cornstarch). And make sure your coconut cream is nice and thick by using coconut cream in place of milk. Hope that helps! Followed the recipe to the T… its delicious! But there were a few things that happened that I’m not sure what I did wrong. I had to make the pie crust because it was sopping wet, even after baking and cooling. Second time I only added 1 tbsp of coconut oil and it still came out slightly damp but eatable. Next time I think I may just do 1/2 tbsp. And I used a standard pie dish, but the filling and whipped cream didn’t come anywhere near filling it like it looks in the picture. Next time I definitely have to double the recipe.. unfortunately I made this for our thanksgiving dinner tonight and don’t have time to make another batch of filling.. But what I do have it delicious!! Had the same exact problem with the crust… so oily! Probably should have just added in more oats or something to get it dry again. Must have been the pecans, it could have probably worked without any oil. I have had my eye on this recipe for long time and finally got around to making it today. I’ve never been a huge fan of coconut…so I added a layer of your delicious vegan lemon curd to cut through the coconut and creaminess. Oh my lord. It is so delicious, I just had to tell you. The base is incredible, crunchy and wholesome. The only downside was the filling was a tad soft. Thank you. Now I just need to find friends to help me eat it! This pie is amaaaazing!!! Any coconut fanatic needs this in their life. It’s super easy to make and beyond delicious. I can’t get enough of it (I’m eating some as I type this) :) thanks for another awesome recipe!!! This looks delicious! I would love to make so many of you recipes but don’t always have the different kinds of nuts on hand because they tend to be so expensive. Where do you buy your nuts from? I’ve been a professional natural foods chef for over 25 years. Some of my clients recently asked for something with coconut cream. I’m glad I tested this recipe first. Unfortunately most of the basic elements of this recipe did not work.! The only part that worked for me was the proportion of cornstarch to liquid in the filling. I appreciate your wanting to share. I usually don’t review recipes, but this one failed so badly, I felt it only fair to do so. I wish you were more specific. I made it, and it worked perfectly. What didn’t work for you? I made the crust and filling yesterday and the crust was excellent, however my filling was slightly gelatinous. I have never eaten a cream pie, vegan or otherwise, so I am not entirely sure if that is the consistency it is supposed to be? But it was very hard to spread it on the crust evenly and smoothly after it cooled down. I ended up just making a little bit more filling and putting it over the top to make it look nicer, even though no one would see it with the cream on top. I didn’t whip the cream with the filling because I knew there was no way it would properly incorporate. I take that this is due to the corn starch? Love your photography by the way! It’s always lovely to see! My experience was that the filling was gelatinous as well, but it did mix with the cream topping well. You just end up breaking it up and mixing it together. Try it – it does work! Thanks for this tip! Making it for grandma’s 93rd birthday tomorrow and having he same issue! The only thing I can think went wrong is letting it chill for too long (3 hours) before mixing the whip cream in. I’m letting it set out a while and planning on mixing it once it “melts” a bit. Praying it turns out after so much work and an excited granny!!! Are you vegan? I am only a vegetarian but I was formerly vegan in my younger days so I do enjoy the recipes for baking. If you are not vegan you could add milk with the light coconut milk to make it lighter in fat. And I don’t see why you cannot use aquafaba as the meringue topping. I made a regular meringue topping for this pie because I have an aversion to baked goods with too much fat as well. :c I also did 1/3 cup of the nuts for the crust and compensated the rest for more oats & some coconut. I loved the crust. Why not coconut milk from a box? I avoid canned goods whenever possible. coconut milk from a box is the equivalent of cows milk from a carton, which wouldn’t work for whipped cream. You need cow cream to make whipped cream, and the vegan substitute is coconut cream. Canned coconut cream is much more creamy and fatty than the box coconut milk. I made this for a 4th of July party and it was a huge hit. My favorite part is the crust — it’s not fussy at all, which makes it a crust recipe I can imagine using as a gluten-free go-to. I had to alter the recipe slightly, because I only had 2 cans of coconut milk, both full-fat. I made the filling and whipped cream according to the recipe but I didn’t mix 1/2 of the whipped cream in with the filling. I poured the filling into the crust, topped it with the whipped cream. I definitely missed that 3rd can though…I wanted more filling…but what was in there was delicious. I just bought 3 cans of coconut milk so I can try again. 5 stars even with a grocery shopping mess-up on my end. I made this over the past two days. Although the process is long…the end result is SO GOOOOD. Definetly worth it to make if you have some free time. My mouth is watering! Really shows how easy it is to make delicious vegan recipes! Cannot wait to try this!! :) the look of the banana cream pie had me drooling but being allergic to them I was worried I’d be missing out on some goodies, thank you! I made this with a pecan oat crust and had to add cream of tar tar to the whip cream as the coconut milk wasn’t full fat- which added a yummy tangy flavour. I refrigerated it over night before eating- so yummy!! That looks amazing!! I am so excited to make it. Thank you for sharing!! So I tried making this- and it tastes good but very oil-y. I understand coconut milk is very fatty but the pudding mixture was extremely oil-y and after a few minutes of setting before going into the fridge a good amount of oil was on top. Did this happen to you and is it just the nature of coconut milk? Also, as a result, could you sub another milk to reduce the fat? Thanks! Hmm, that doesn’t sound right! Why would there be oil in the pudding? I didn’t put oil in the pudding, I believe it’s from the canned coconut milk. It sounds like you got a bad can of coconut milk to me. Sorry it didn’t work out! I just did the pie with rice milk and it turned out great as well :) Maybe you can try that! Great recipe! I saw it in my email this weekend and couldn’t wait to make it, so it was my Monday morning project. I just had a slice and it is delightful. I used toasted shredded coconut in the filling and toasted flakes on top. It has a great natural coconut flavor and isn’t overly sweet. Thank you! Lovely! Thanks for sharing, Maria! I can’t believe that this pie is both Vegan AND GF! Thanks for the awesome recipe! I just want to thank you for creating amazing recipes to make being vegan that much easier! I am not much a baker but this looks amazing! I might have to give it a shot! We must be on the same wavelength. I was just talking to my husband about attempting a gluten free vegan coconut cream pie. Thanks for being a. Step ahead so I dont have to make 5 pies this week! I can’t wait to see how this turns out. I cant wait to try this. I love your recipes and have not found a bad one yet. I just made your brownies and everyone loved them. Thanks for all the work so we can have tasty vegan recupes. Hi, great recipe and pictures. I wanted to ask what do you use for the background here? This blue thing – is it a foam board? I’m always duly impressed with the backgrounds on this site too! Especially the yellow ones. Love them. Anyhow, another award-winning recipe, I’m new to Graham cracker crusts – been using Oreo crusts but I think it’s time to switch it up. This reminds me of the pie on Gilligan’s Island that Mariann makes…..great show! My boys are allergic to nuts. What is a good substitute in your crust? Thank you!